Earnings with all the extra fixings had Wall Street gobbling up Shake Shack Inc (NYSE:SHAK) Friday. But if you’re thinking of taking your first bite of SHAK stock, this strategist would recommend a modified fence strategy off the options menu instead. Let me explain. It was a literal feeding frenzy in SHAK stock to finish out last week as shares soared higher by 18% to fresh intermediate highs. Behind investors’ insatiable appetite, Shake Shack delighted with a made-to-order combo which bested the Street’s bottom- and top-line estimates and topped off the results with increased full year sales guidance. By the numbers, SHACK stock delivered a profit beat by 7 cents with earnings of 15 cents. Revenues of $99.1 million which topped forecasts of $96.7 million and representing a near 32% increase from the year-ago period. But Shake Shack’s report wasn’t perfect. Management’s forecasted same-store sales of 0% to 1% isn’t what most investors would label as satisfying or well-done growth. Nevertheless, the beat and guidance did have the effect of easing concerns the fresh-casual burger joint is expanding too quickly at the risk of cannibalizing its same-store sales. Hmm … I guess the question for bullish investors is whether they’d like a potentially volatile “shake” with that order of SHAK stock, as Wall Street continues to digest the report? Looking at SHAK stock’s weekly chart for a bit more supportive guidance than the kind management delivered, and technically shares do appear to deliver on that front. Following a near-two year-long flat basing pattern off all-time-lows, in 2018 SHAK is doing a solid job of confirming a new bull trend is in-the-works. The largest concern in the aftermath of Friday’s price surge is the increased likelihood of some backing and filling in shares of Shake Shack. That being said, I don’t believe SHAK is going to put together price action resembling a gap-and-crap pattern. The real difficulty for bullish investors is whether to wait for a short-term overbought condition to diffuse itself or play Friday’s momentum. Either decision carries a decent amount of risk in this strategist’s view. The good news is bulls can order a spread from the SHAK options menu while safeguarding against those type risks with less exposure and increased control. For investors agreeable with what has been presented, one strategy which vastly reduces and limits risk while keeping potential gains in SHAK stock unlimited, theoretically at least, is a bullish modified fence. One favored combination is purchasing the June $60 call and selling the June $55/$52.50 put spread. With shares at $55.95 the strategy is priced for even-money or no cost on the offer side of the market. The chief objective is for the out-of-the-money $60 call to move in-the-money before expiration. 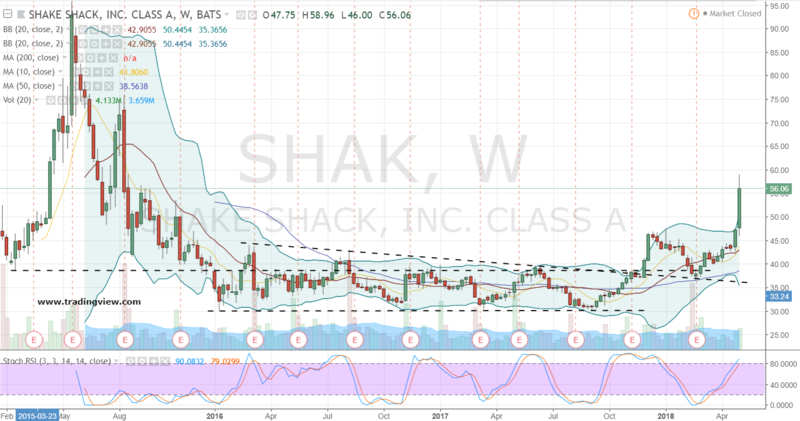 Thus, if SHAK stock rallied to $63, the modified fence would expand from $0 to $3. Further, if a rally towards the strike occurs sooner rather than later, the spread enjoys the added benefit of the call growing in value through the building of time premium. If shares lose Friday’s mojo, risk is ultimately contained to $2.50 below $52.50 or roughly 4% of SHAK stock. In of itself, that’s attractive insurance to have in place given the heightened price volatility. But as this trader’s exposure can’t get any larger, this strategy works well for bulls looking to accumulate SHAK on any potential exaggerated price weakness below the put spread which might develop in the days and weeks ahead. Investment accounts under Christopher Tyler’s management do not currently own positions in any securities mentioned in this article. The information offered is based upon Christopher Tyler’s observations and strictly intended for educational purposes only; the use of which is the responsibility of the individual. . For additional market insights and related musings, follow Chris on Twitter @Options_CAT and StockTwits. Article printed from InvestorPlace Media, https://investorplace.com/2018/05/shake-shack-inc-100-pure-bullishness/.